The Partnership for Transforming Health Systems Phase II (PATHS2) is a six year national programme funded by the UK Department for International Development (DFID) to strengthen Nigeria’s health system. PATHS2 seeks to contribute to effective and efficient use of Nigeria’s resources to achieve the health related Millennium Development Goals 4 and 5. PATHS2 is working to improve planning, financing and delivery of sustainable and replicable pro-poor health services for common health problems in five states in Nigeria – Enugu, Jigawa, Lagos, Kaduna, and Kano. By influencing and changing processes of health systems governance at federal and state level and encouraging citizen engagement and participation, PATHS2 aims to improve health outcomes for the poor and socially excluded in these five focal states. PATHS2 is one of four State-Led Programmes (SLPs) developed by DFID which include the Strengthening Accountability and Voice Initiative (SAVI), the Education Sector Support Programme in Nigeria (ESSPIN), and the State Programme for Accountability Responsiveness and Capability (SPARC). The PATHS2 mid-term evaluation study was managed by Itad in association with ORB International and the Nigerian based survey company Practical Sampling International (PSI). The study involved two components: a large scale household survey and a comprehensive facility evaluation. 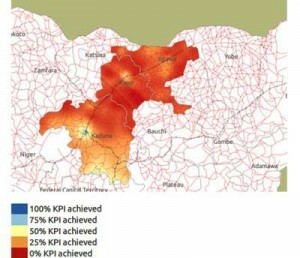 The purpose of the household survey was to examine the demand side of health services delivery in Nigeria by collecting data on health seeking behaviour and satisfaction with services provided at government health facilities; as well as to measure public information and knowledge regarding disease prevention and access to care. The facility evaluation involved three surveys: a facility survey, a provider survey, and a logistics addendum. This study examined the supply side of health services delivery in Nigeria by assessing the preparedness of facilities in delivering health services to the population. This component of the project assessed the quality of health services infrastructure, staffing needs and levels of qualification, experience and knowledge of healthcare professionals working in facilities, availability of medical supplies including drugs, and types of maternal and new-born health services provided. The results of this mid-term evaluation were used to inform the ongoing implementation of PATHS2 and provided policy makers with clear evidence (presented both numerically and on ‘heat’ maps – see diagram) of areas where the demand and supply issues around Key Performance Indicators were greatest.